Syn Free Oven Baked Onion Bhaji, the perfect side for your Indian Fakeaway meal. 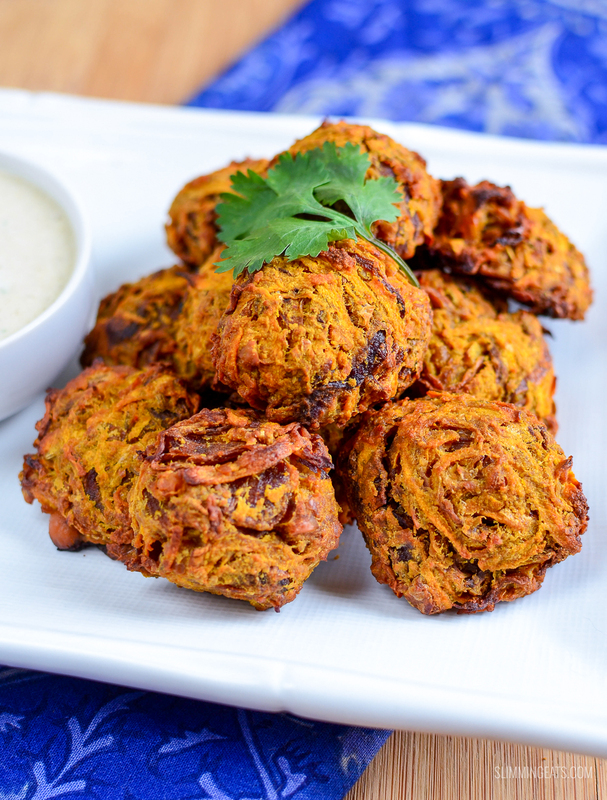 An Indian meal isn’t complete without some onion bhaji with a side of mint yoghurt. Traditionally they are deep fried in oil (usually ghee), but here we have a much healthier version that is baked in the oven. They are delicious just on their own, but also make a great side dish to any homemade Indian dish. I made two version of these, spicy ones with green chilli for the adults and then without for the kids. It is up to you which ones you prefer. Spray a frying pan over a medium heat with spray oil. Add onion and season well with salt. Add the chickpeas to a mini food processor with the egg and pulse till smooth. Line a baking tray with parchment paper and form the mixture into equal sized balls. Place on the tray and spray over the top with top with spray oil and bake in the oven for 30 mins, till golden. Mix together the yogurt, mint, lemon juice, pinch of salt and maple syrup (or sweetener) plus Chutney Podina Masala if using and serve this on the side. The ‘rate this recipe’ wouldn’t allow me to give the recipe 5*. 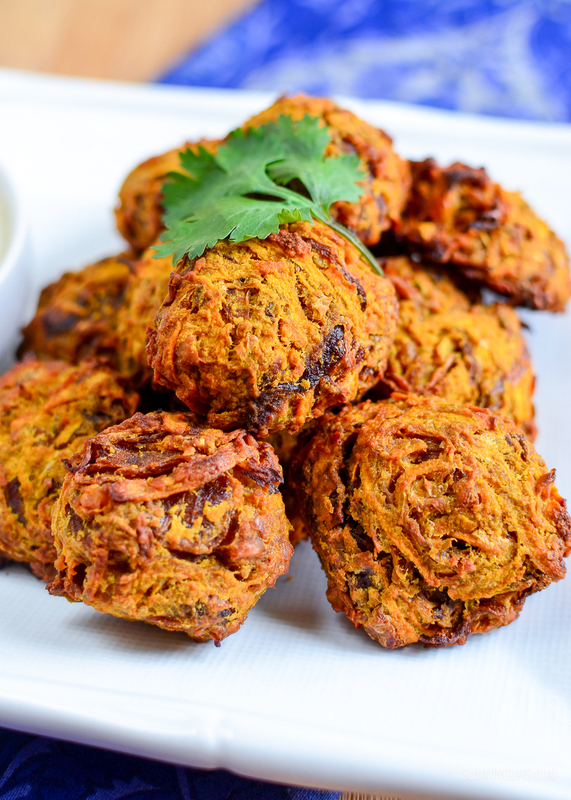 These bhajis are fantastic, well worth making. I’m going to make a batch to freeze asap. These were amazing! Didn’t make the sauce. Husband has requested them again, they were THAT good. Highly recommend these! Made a few substitutions…the sweet potato for carrot and the Ajwain seeds for Nigella seeds! Delicious and so easy to make! Not much more I can say except for ‘YUM’. Thank you for another cracking recipe. I am never sure how many *balls* to make from this recipe….I know it serves 4 so I guess as long as I divide whatever number I make by 4…I should have a serving? Totally depends on the size you make them. I usually get 3 to 4 per person. Can I make the day before and keep them in the fridge then cook just before servings? Just made these. Absolutely delicious and everyone in the family enjoyed them. Really delicious! Thanks so much! Everyone in my family loved these. Hi, was just wondering if these can be frozen to be reheated at a later date?